Heg’s parents immigrated to Wisconsin in 1840, settling in Racine County. In 1849 Heg went to California for two years, seeking gold. After his return, he spent the next decade farming. In 1859 he was elected state prison commissioner, and was reelected two years later. 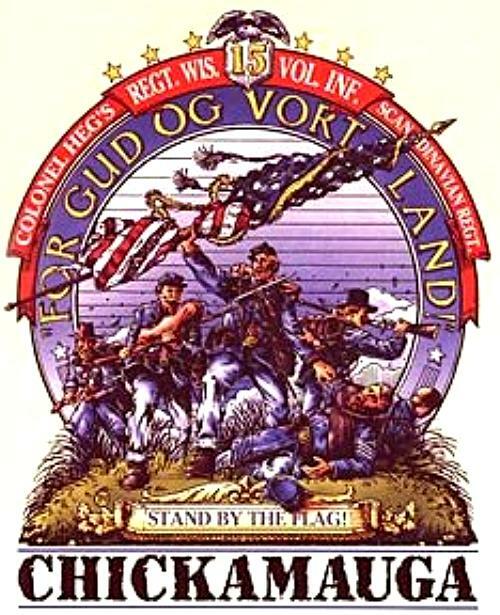 Upon the outbreak of the Civil War, he raised the 15th Wisconsin Volunteer Infantry, which was nicknamed the Scandinavian Regiment. By 1863 Colonel Heg was in charge the Third Brigade in the army of William S. Rosecrans, commanding the 15th Wisconsin, 25th and 35th Illinois, and 8th Kansas regiments. (Rosecrans’ chief of staff, who relayed orders to Heg, was future president James A. Garfield). In the summer of 1863 Heg participated in the Middle Tennessee campaign, and settled in with the Union army at Chattanooga. In mid-September Rosecrans moved south against the army of Braxton Bragg, encountering the Confederates a few miles south of Chattanooga drawn up along the banks of Chickamauga Creek. 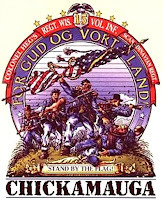 Heg and his men arrived on the right of the Union line around noon on September 19, 1863. After advancing a short way they were met with a volley from Rebels concealed in heavy woods. They held their ground, “cheered on by the gallant Colonel Heg, who was everywhere present, careless of danger.” Several times they were forced to fall back, then reformed and advanced. Then between 4 and 5 p.m. Hood’s Texans attacked, and his six Confederate bridades overwhelmed the Union three. Heg was mortally wounded in the attack; 696 of the 1,218 of his men who had gone into battle were killed, wounded or missing, a casualty rate of more than 50%. The following day the Confederates completed the route of the Union army, driving Rosecrans all the way back to Chattanooga. Almost 35,000 men were lost between the two armies in one of the fiercest battles of the war.